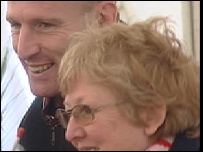 Injured Welsh rugby captain Gareth Thomas has taken a break from the game's troubles by getting a taste of the cawl world championship. Thomas, out of the rest of the Six Nations with a neck injury, was at the contest in Saundersfoot on Saturday. As the row continues over coach Mike Ruddock's departure, Thomas - known as Alfie - said it was nice to visit the town and relax with his family. The winner takes the title Cawl Cooking Champion of the World and Elsewhere. It will be decided by members of the public who follow the village's cawl trail on Saturday and Sunday. I was brought up on my grandmother's cawl with lamb. I think they should feed that to the Welsh rugby team - it would do them a lot of good. 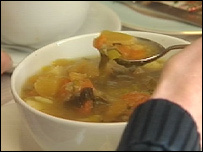 This is the sixth Saundersfoot contest to cook cawl, the traditional Welsh meat and vegetable dish. The defending champion is Paul Lewis, who runs a tea room in the village. All this year's competitors come from hotels and pubs in the village, but organiser Andrew Evans said there was an "open invitation" for anyone in the world to enter. The only condition of entry is to join the local chamber of tourism. 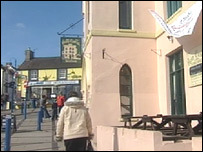 The competition is held in a marquee on the harbour in the centre of the village. Mr Evans told the BBC News website: "People come into the marquee, they collect a mug for £2 and go around the trail map to sample the different cawls from the various establishment. "Then they mark their forms as 'good', 'great' or 'world class'." Members of the public and follow the cawl trail between 1200 and 1500 GMT on Saturday and Sunday. Mr Evans said he invited competitors "religiously" from across Wales but said he thought they were "scared" to come to Saundersfoot. He joked that cooks outside Wales "didn't understand cawl", but he would willingly accept entrants from England and beyond. "You can have five ingredients and you can have the same recipe and everyone's can taste different," he added. "I'm a traditionalist - I'm seriously into lamb. I was brought up on my grandmother's cawl with lamb. "I think they should feed that to the Welsh rugby team - it would do them a lot of good." Ingredients of cawl vary, but usually include Welsh lamb and leeks. Mutton, beef, pork or bacon are other meats often used. The meal was traditionally cooked in an iron pot or cauldron over the fire.